Like Alfred Boucher, Rodin is seduced by the exceptional talent of his new student. At the age of 19, she is admitted to his studio as an assistant and rapidly becomes his collaborator, mistress, model and muse. In 1881, Louise Athanaïse Claudel moves with her three children to Paris (135 Boulevard du Montparnasse). She has evidently given in to her husband’s desire to provide their son the opportunity to pursue a higher education. Paul enters the Lycée Louis le Grand, while Camille takes sculpting lessons at the Académie Colarossi (10 Rue de la Grande Chaumière). In 1882, the family lives at 111 Rue Notre-Dame des Champs. Camille Claudel rents a studio at n° 177 of the same street, sharing the rent with other young women, most of whom are English. Alfred Boucher visits once a week to correct their work. Rodin agrees to take over from his friend Alfred Boucher, to whom the Prix du Salon of 1882 offers the opportunity to enjoy a study trip to Italy. In the autumn, the latter departs for Florence. Alfred Boucher had presented Camille Claudel to Paul Dubois, a native of Nogent-sur-Seine, director of the École des Beaux-Arts fine arts school. Paul Dubois is cited among the young sculptor’s masters in the Salon catalogues, but his role in her apprenticeship at this time remains unknown. The Old Helen bust dates from this period. The teachings of Alfred Boucher are evident in this work’s naturalistic style. In 1880, the Department of Fine Arts had commissioned Rodin to design the portal to the future Museum of Decorative Arts (The Gates of Hell), to be built on the site of the old Court of Auditors burnt down during the Paris Commune in 1871. This commission allowed him to benefit from a studio at the state marble depot, located on Rue de l’Université, which he would retain for the rest of his life, and obligated him to hire assistants, especially as this commission was soon followed by that for The Burghers of Calais (officially commissioned in January 1885). He would work on this ensemble in his studio at 117 Boulevard de Vaugirard. Rodin is seduced by the fiery temperament and exceptional talent of his new student. In 1884, she is admitted to his studio as an assistant and rapidly becomes his collaborator, mistress, model and muse. They work together in harmony, sharing studios and models. Her own works betray the influence of her master. Their intense, tormented relationship would have an everlasting effect on both artists. Jessie Lipscomb, a young English sculptor, arrives in Paris in 1883. She stays with the Claudels, while working at the studio at 177 Rue des Petits Champs. 1885: The Claudel family moves to 31 Boulevard de Port-Royal. In April, Camille Claudel registers for the anatomy gallery of the Natural History Museum. 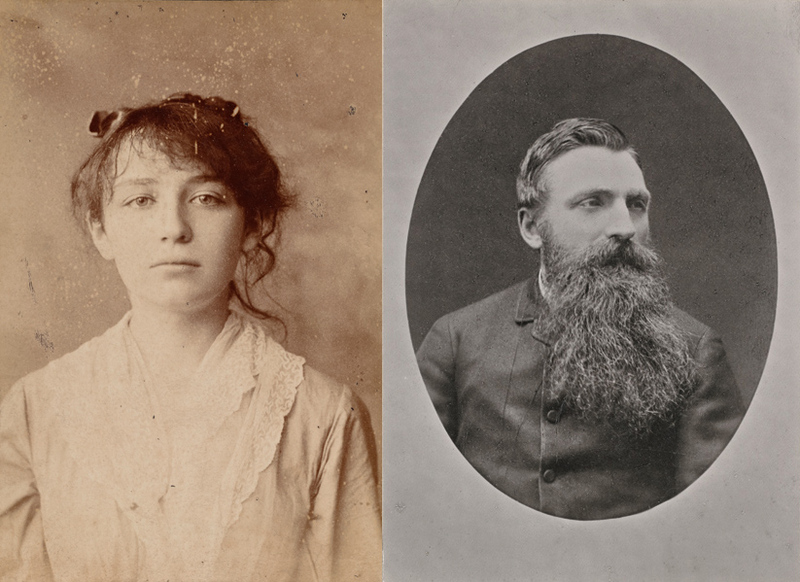 Paul and Camille Claudel attend Mallarmé’s famous Tuesday gatherings.